Barnard Castle School as we know it today was founded thanks to the combined efforts of Victorian visionaries who were determined to improve education in the North East of England towards the end of the 19th Century. A committee formed in 1869, led by the Reverend Canon Dwarris and connected with Durham University, had been seeking a central location to establish a boys’ boarding school. Their efforts caught the attention of the trustees of the late philanthropist Benjamin Flounders’ estate. Flounders, a member of the committee that resolved that a railway from Stockton to Darlington was preferable to a canal, died in 1846 but bequeathed his estate for the extension and encouragement of education. The third, critical element was provided by St John’s Hospital, in Barnard Castle, which, simultaneously, had been framing a scheme for a grammar school. The plans came together, funded by £31,495 from Benjamin Flounders and £10,710 from St John’s Hospital, which was founded in 1229 by John Balliol, Lord of Barnard Castle at the time, from a discontinued scheme established to provide a hostel for impoverished women. The task of raising a further £10,000 in voluntary subscriptions fell to Earl Grey and Archdeacon Hamilton, whose efforts ultimately brought in £11,350 towards the project. In August 1882, a site was chosen for the then North Eastern County School on land in Newgate, Barnard Castle belonging to St John’s Hospital. Joseph Kyle, who had built the Bowes Museum, was contracted to build the school, at a cost of £28,000 including furnishings. Whilst construction took place, the school opened temporarily at Middleton-One-Row, a village east of Darlington. May 2nd 1882: Queen Victoria signs the scheme for creating the North Eastern County School at Barnard Castle with a stipulation that the governing board should include the Lord Lieutenants of the three counties, Durham, York and Northumberland. September 11th 1883: The North Eastern County School opens under the leadership of headmaster Reverend F.L. Brereton in temporary accommodation at Pemberton House, Middleton-One-Row, with 25 boarders and 10 day boys, two masters, a matron and a secretary. The school has large fields at the front and back of the house, a fruit and vegetable garden and the village church hosts the school for Sunday afternoon services. November 6th 1883: The Bishop of Durham blesses the laying of the foundation stone at Barnard Castle. February 1884: The growth of the school at Middleton-One-Row, which is now up to 43 boarders and ten day pupils, requires expansion to Violet Villa in the village for classrooms, so rooms at Pemberton House can be used as dormitories. The school game is football and the boys also play cricket in the school colours, which are chosen as chocolate and blue. February 2nd 1886: The school moves to its permanent location at Barnard Castle with 116 boarders and 12 day boys. The buildings comprise big school, the dining hall, six classrooms, 12 dormitories over two floors (for 25 boys each), masters’ rooms, the kitchens, bakery and steam laundry. The headmaster’s accommodation is at the east end of the building. The north, east and west blocks are used to represent the three houses of Northumberland, York and Durham. December 1887: Pupil numbers have reached 219 boarders and 31 day boys as Rev Brereton resigns as headmaster. January 1888: Edward Henry Prest takes up his appointment as headmaster. Later this year the first panels are installed in the dining hall and the names of the cricket and football teams added. 1890: Sanatorium and hospital buildings open for pupils with infectious diseases opened. The study of agriculture is added to the curriculum, which already includes botany and land surveying. The boys take part in boxing, wrestling and fencing, alongside other sports. 1892: The first Barnard Run is held – prior to this date annual paper chases are held. Twenty five boys from each house run a course starting at the Tees viaduct, along the Yorkshire side of the river crossing Cotherstone suspension bridge then back along the river through Flatts Wood and on to school. Winners Durham house receive the first Barnard Cup. 1894: Rev Brereton returns as headmaster following the sudden death of Edward Prest, staying in post the second time for 30 years until retiring in 1924. 1895: The Old Boys’ Club is founded, later to become Old Barnardians once the school’s name changes. 1896: The school swimming pool opens, thought to be the first in a British boarding school. The total cost was £1,945. 1899-1902: Seventy-five OBs are engaged in the war in South Africa, six die through wounds or disease. 1901: Death of Canon Dwarris, instrumental in founding the school, and Bishop Westcott, chair of governors for 11 years. 1905: Six months in the planning, a significant two-day fete and bazaar with a range of entertainment, exhibitions and stalls are held throughout the school to raise money for a school Chapel. 1909: The Officers Training Corps (OTC) is founded on the recommendation of the War Office and following a long-held desire at school for a cadet corps. July 6th 1910: The Chapel foundation stone is laid. Prior to the Chapel being built prayers are held in big school. The Bishop of Durham performs the blessing on May 23rd 1911. 1912: Chapel opens, initially with chairs – each member of the school is asked to donate the value of a chair towards the furniture – and bare stone walls. The desks are made by boys in the school joiner’s shop from donated timber. January 1914: OB Bentley Beetham joins the staff. September 1914: Barnard Castle Preparatory School opens with ten boys in Westwick Lodge, under the charge of Mr and Mrs Boardman. Built around 1890 as a family home, the Victorian villa first opened as a school – Barnard Castle School for Girls and Preparatory School for Boys – in 1905, led by Miss Mosey. In 1913 the governors of the County School explore the idea of opening a preparatory department for boys aged 8-11. 1914-18: World War I. Five staff and 146 boys and OBs, of the 740 who volunteer, largely before conscription begins, are killed; 89 receive military honours or mentions in dispatches. OB Lieutenant Commander George Nicholson Bradford receives the Victoria Cross for his actions on his 31st birthday – April 23rd 1918 – at Zeebrugge. Fatalities among the school community, at one in five, are extraordinarily high; the average age of those killed is just 20. Oak panels and the great east window are added later to the Chapel walls to commemorate the dead. 1916-17: Part of the school fields, the agriculture plots and Westwick Lodge garden are planted with potatoes to support the war effort. The crops are sold with profits given to war funds. Squads of boys help local farmers. 1918: A terrible flu epidemic sweeps through school and all boys who have escaped it so far are sent home early for Christmas. Three boys and one master die from the virus. 1921: The organ is installed in Chapel. An additional hospital building is added to cope with regular outbreaks of infectious diseases including flu, scarlet fever and mumps. The first discussions over changing the school’s name to Barnard Castle School take place at a governors’ meeting. 1923: After renting Westwick Lodge for eight years, the school buys the Prep School building for £3,000. Bentley Beetham accepts an invitation to join the 1924 ascent of Mount Everest. 1924: A.G. Coombs becomes headmaster following the retirement of F.L. Brereton, and the school’s name changes to Barnard Castle School. 1928: Two years after many boys witness their first rugby match, it becomes an official school game. 1935: H.E Birkbeck becomes headmaster. 1939: World War II begins. Zig-zag trenches are dug in the playing fields in case of sudden air raids. As the war continues, boys take on washing-up duties to cover for a shortage in domestic staff. 1952: Pews are installed in Chapel as part of a memorial to the 55 former members of the school who were killed in World War II. 1961: Barney become the first school to hold simultaneously the Public Schools Freestyle Relay (the Bath Cup) and the Medley Relay (the Otter Cup). 1964: Fire breaks out in the kitchens, destroying the resident maids’ room and the kitchen ceiling. 1965: S.D Woods becomes headmaster. 1968: A new classroom block is built at Prep School. 1978-79: The Spring term starts 13 days late after around 100 radiators break due to extreme cold during the Christmas holidays. Forty tons of scrap metal have to be removed and new radiators installed. 1980: F.S. 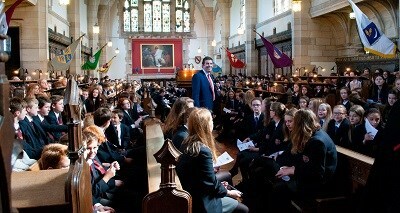 McNamara becomes headmaster. 1982: Barney becomes co-educational with girls joining the Sixth Form. Boarders initially stay in town. 1987: Longfield House for girl boarders is completed. 1997: M.D. 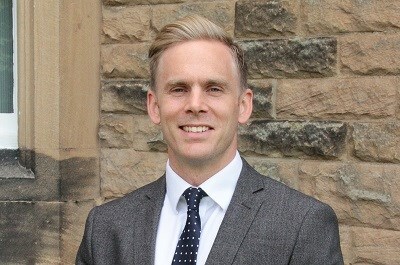 Featherstone becomes headmaster. 1992: Old Barnardians Rory and Tony Underwood, and Rob Andrew play in the England XV against South Africa at Twickenham. 1992: The age of entry to Prep School is lowered to 7 and girls return to Westwick Lodge (although two daughters of senior school staff had attended Prep in the 1940s). Facilities also grow with the addition of Mount Eff Lodge and Westwick House. 1996: Prep School grows again with the addition of three Pre-Prep classes. 1998: Old Courts opens to provide a boarding house for Prep School children. 2004: David H. Ewart becomes headmaster. 2007: The First XV play in the final of The Daily Mail U18 Cup at Twickenham for the third time. 2008: The Atkinson Hall, named after former governor Rae Atkinson, opens at Prep School in an extension that includes an art room and library. 2010: Alan Stevens becomes the school’s ninth headmaster (or tenth if F.L Brereton’s two stints as headmaster are included separately). 2015: Laura Turner starts a new century for Prep School as its eighth head and first headmistress. Mrs Turner, along with her predecessors Carl Rycroft and Ted Haslam, end a tradition of the Prep School headmaster previously being a teacher at Barnard Castle School. 2016: The Duke of Gloucester officially opens the dedicated Sixth Form Centre, named after Old Barnardian and former housemaster Kenneth King. 2016: Prep School deputy headmaster Nick Seddon, in his 100th term at the school, officially opens the Centenary Building, part of an expansion that includes two new classrooms, a reading area, a dedicated science laboratory, a science garden and an AstroTurf pitch.